The Mets lost to the Brewers tonight by six runs. Aside from Eric Thames’s big dinger, what happened on the field was not particularly notable (the Mets lose all the time). 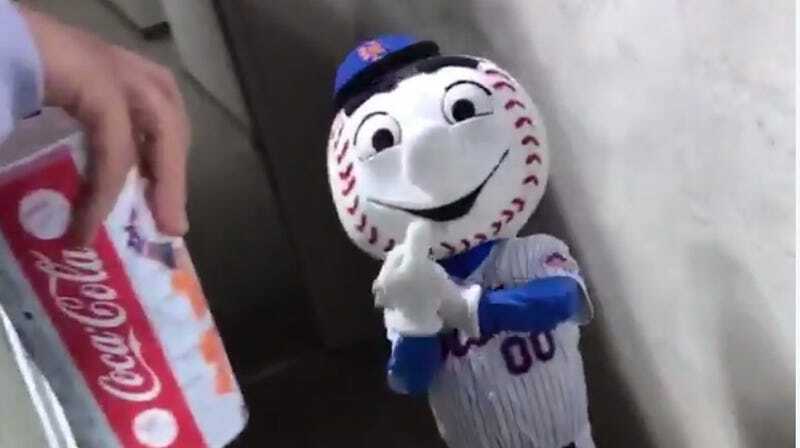 However, right next to the field, Mr. Met provided the highlight of the night when he flipped off a fan who was videotaping the interaction. He looks so happy to be flipping the bird. The Mets apologized for the “inappropriate action” of “this employee” a few hours later. Jacob deGrom gave up seven earned runs, but they are probably talking about Mr. Met. Despite breaking character in a delightful way, Mr. Met is probably going to get in trouble. We’ve reached out to the Mets for clarification about which employee they’re talking about, and will update this post if we hear back.